When Ronald Reagan bade us fairwell in 1992, he wished that we would "travel the road ahead with liberty's lamp guiding your steps and opportunity's arm steadying your way." He came to the presidency in 1980 during a troubled time when tension between the United States and the Soviet Union was threatening to lead to nuclear annihilation. He righted the ship and gave us a sense of purpose and optimism again. But it was his words after losing the Republican presidential nomination in 1976 that stand out the most now having seen the tears in Sarah Palin's eyes and hearing the disappointment in John McCain's voice that fateful November night in 2008. If Ronald Reagan was with us that day, he would have surely repeated these words to us: "Don't get cynical because, look at yourselves and what you were willing to do and recognize that there are millions and millions of Americans out there that want what you want, that want it to be that way (his voice cracks), that want it to be a shining city on a hill." During the economic harshness of the Carter years, Reagan was the keeper of the lamp in exile before being elected in 1980 after which he held liberty's lamp in front of a country that was on the move again as he led us to that shining city on a hill overlooking a wonderful world where the Statue of Liberty was anew again after being refurbished and the Berlin Wall was no longer. 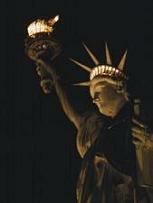 Liberty's lamp not only lit up the shining city, it became a beacon of freedom to the world once again. Ronald Reagan passed away June 5, 2004 leaving a void in the hearts and minds of his faithful. With no leader to guide them, Reagan's followers wandered in the political wilderness. The lamp had only temporary keepers as they spent the years searching for someone of Reagan's caliber to carry it. Newt Gingrich carried the lamp. George W. Bush carried the lamp. As qualified as they were to lead us, the light would not burn as brightly as it did while in Reagan's hands. Carrying liberty's lamp is not a task to be undertaken by just anyone. It requires bold leadership, vision and a strength to go against tides and fight for positions that some may brutally criticize you for. Carrying liberty's lamp is not for the faint of heart or the philosophically weak. It is a task that should only be assigned to someone with Reagan's character, values and strength of convictions. It is the only metaphorical way we can keep the ideals and fondness of Ronald Reagan alive and pass them on to future generations. From here on forward, political parties will choose candidates and win elections. But it will only be so often that someone will come along and carry the lamp in such a way that it will ever shine as brightly as it did when Reagan carried it. We will know that person when see and feel Ronald Reagan's presence in his or her words, deeds and heart. We look to our country's founders and we look to those who carry Ronald Reagan's presence in their hearts to find the essence of America. We are moved by Ronald Reagan's distinct dedication to the philosophy, vision, intent, desires and aspirations of what the this country's founders set as the foundation for what it really means to be American. And so should we be moved by anyone who comes after him who embraces, embodies and represents the same spirit. For it is the spirit and presence of Reagan and the values of Reagan that will never die. While our great leader has passed from our world, what he left us with should live on forever. We look, we seek and we search for those who aspire to represent the philosophy and wisdom the way Ronald Reagan would want us to understand it. There is a pure ideological connection that is rare in political life. While there are candidates who may represent your views or support your interests, the moment of pure oneness with a candidate is rare, as it was with Ronald Reagan. And so that brings me to this moment where it is time for our next great leader to step up and carry liberty's lamp. I've seen political candidates come and go. I've seen success stories and I've seen failings. But, I've never felt the way about any other political leader the way I did about Ronald Reagan... until now. Sarah Palin, please take the lamp now and lead us.